Summon your Piggy minion. Many have tried casting Esuna on what they thought was a struggling adventurer, only to find they had wasted their magic. 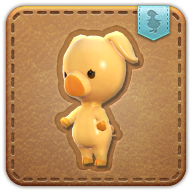 A mysterious bipedal swine given away as a prize after it was discovered gorging itself in the Manderville Gold Saucer kitchens. Assuming he is not a real pig, many have tried poking, unmasking, and dispelling the portly pork's guise... but to no avail.